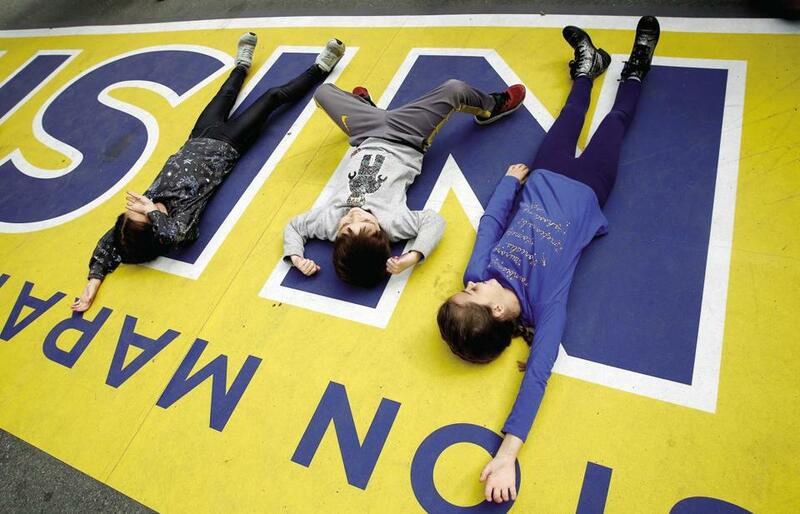 Children played on the finish line of the Boston Marathon on Sunday. Banks: Open, although some along the Marathon route may be closed. Mail: Post offices open. Some blue collection mailboxes along the Marathon route will be sealed shut from after the last collection Saturday until Tuesday morning. Visit usps.com to find alternate locations for secure mail deposits. MBTA: Red, Orange, Blue, and Silver lines will operate on a regular weekday schedule with rush-hour service before and after the Marathon. The Green Line’s Copley Station will be closed all day, and South Street (B Branch), Kent Street (C Branch), and St. Mary’s Street (C Branch) will be closed from about 10 a.m. to 6 p.m. Buses will operate on a regular weekday schedule, though some routes will be detoured. Commuter rail will operate on weekday schedule with additional service on the Framingham/Worcester line. Hingham and Charlestown commuter boats and The Ride will operate on weekday schedule. For more information, call 617-222-3200 or check mbta.com/holidays. Trash/recycling collection: No delay this week in trash or recycling pickup in Back Bay, Bay Village, Beacon Hill, Charlestown, Chinatown, Fenway, Leather District, Mission Hill, North End, Roxbury, South Boston, and the South End. One-day delay in Allston/Brighton, Dorchester, East Boston, Jamaica Plain, Mattapan, Roslindale, West Roxbury, and Hyde Park. To monitor your neighborhood’s trash and recycling schedule, download the Trash Day App at: https://www.boston.gov/trash-day-schedule.